As I pointed out before the awesome unexplained miracle does happen. And it sets your spine a tingle. 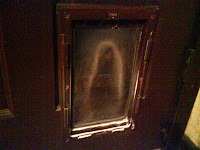 Imagine my surprise when visiting my sister to see the image of the virgin Mary appearing in dog slime on her dog door. (By now, she is probably "the only slightly tarnished Mary". It has been 2000 years, though. Give her a break.) This, my friends, is way better than "Mary on a sandwich" or "Mary on the bathroom door varnish" or "Mary on my dirty window." This was created by living, breathing, loving dogs. Surely this must be a sign! Praise Dog. Now if I can only get her to sell this on Ebay and split the prophets with me. thank you. I'll be here till Tuesday. Remember to tip your waitstaff. Is it my imagination, or does Mary look a little pregnant in that rendition? BTW, I was out of town that weekend. So it is a photo just before the blessed miracle christmas birth. This means the price just doubled. Ahhh, but... it also looks like she is wearing a burqa. Something is amiss. No, the holy robes of the blessed mother. Impressive image. Please notify your local Bishop that you have a psychologist willing to examine your mental state and then testify as to the authenticity of said image. We'll discuss my cut of the proceeds from any sale on EBay later. Finally. Someone willing to play along for money. If this catches on, I might finally be able to quit my day job!!! I'm not convinced. It just looks like a pot-bellied Barred owl to me. Sorry to spoil your plans, but I can't get stoned. I'm on a random testing program. Ah then: crucifixion. Line on the left. One cross each.